Eighth graders Eliza Riggs and Grace Goodroe examine a demonstration seismograph in class at Dempsey Middle School Wednesday. The waveform of seismic activity can be seen on the laptop next to the seismograph. Eric Stewart and Braeden Weidlich examine the waveform from a seismograph that captured the recent 8.1 magnitude earthquake in Mexico. Lisa Giddings’ science class at Dempsey Middle School now has a tool that’s giving them a new perspective on world events: a seismograph. Giddings said a seismograph is an instrument that measures and records details of earthquakes — how long they last and how strong they are. Giddings recently obtained and installed a seismograph in her classroom and said her students have already been able to see results from it. Jeff Fox, a seismologist from the Ohio Division of Geological Survey, helped Giddings set up the device and said the seismograph is essentially a small computer that automatically connects to a website where seismic data from all around the world is collected. Fox said the map shows where other seismographs are, but they are shown as mile-wide circles for privacy reasons. Giddings said the device was installed last month and she was able to record several seismic events including an earthquake in Mexico. She said her students have already become fascinated with the seismograph and said other teachers have also asked about the its readings. 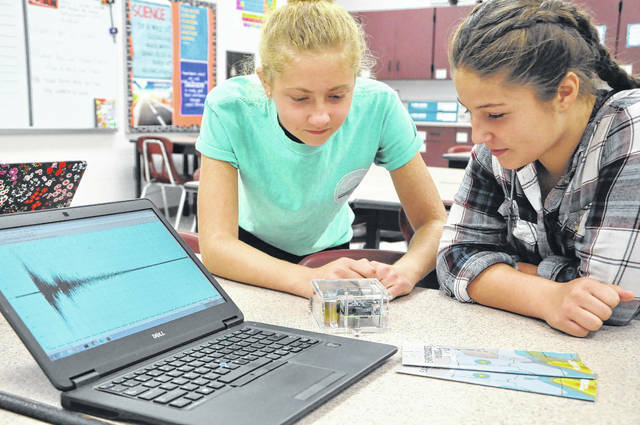 “I think it’s cool that we can see what’s going on in other parts of the world and see other countries and how we can show other countries our seismic data as well,” said Eliza Riggs, an eighth-grader. Eric Stewart, another eighth grader, said one of his favorite parts of the seismograph is the clear plastic shell, which allows students to see the mechanical and computer parts. “I like that it’s clear so you can see the stuff inside and see how it all works,” Stewart said. Riggs added that using the instrument now is great practice for any student who is interested in science as a career. Some students have discovered the seismograph is both educational and entertaining. 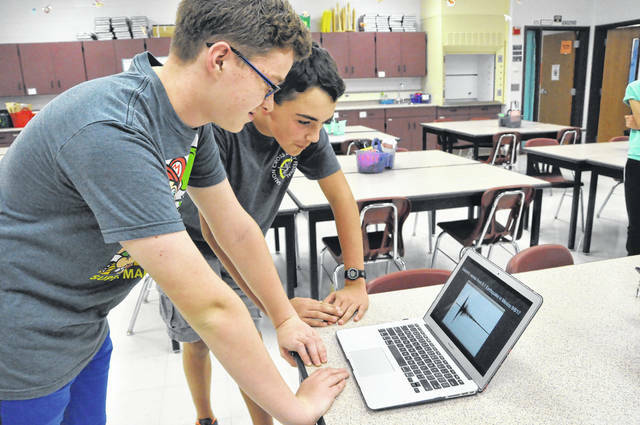 “It’s really neat to be able to know something that you can exactly figure out because you can’t feel the Earth move [the same way as the seismograph],” said Braeden Weidlich. Weidlich joked that he also liked that you can stomp next to the seismograph and see the machine register it. Fox said a seismograph is a great resource for a school because students can compare their data to data all around the world and see how seismic activity from the other side of the world can still be registered at their school.